The love for jewelry runs deep in our family. My grandmother had assembled quite a collection during her lifetime. My grandfather frequently traveled to Scandinavia for business and often surprised her with something precious. After my grandmother passed away, my grandfather was so sweet to ask me to come by and select a few pieces of jewelry that I liked the most. 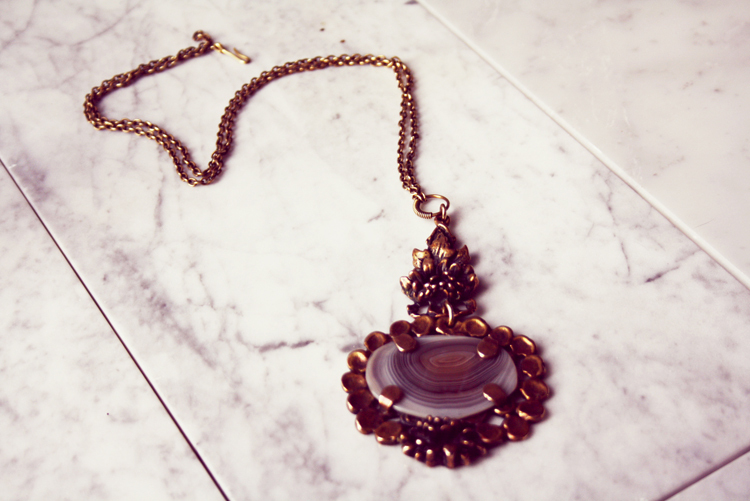 I chose the vintage pieces that were dearest to my grandmother, which mostly weren’t the most valuable ones. I’m a huge sentimentalist, so these pieces have a special place in my heart and in my jewelry box. I usually pick one piece that will become my favorite for a few months. Recently, I rediscovered this bronze costume jewelry piece from Pentti Sarpaneva that I like to wear with a simple white blouse. Posted in JewelryTagged Pentti Sarpaneva, vintage necklaceBookmark the permalink.